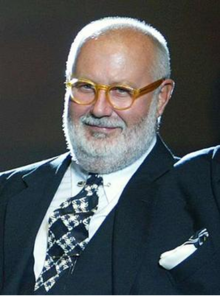 Gianfranco Ferré (Italian pronunciation: [dʒaɱˈfraŋko ferˈre]) (15 August 1944 – 17 June 2007) was an Italian fashion designer also known as "the architect of fashion" for his background and his original attitude toward creating fashion design. Ferré was born on 15 August 1944 in Legnano, near Milan in Lombardy, in northern Italy, the first child of Luigi Ferré and Andrea Morosi. He attended the liceo scientifico of Legnano, and then, from 1963, studied architecture at the Politecnico di Milano in central Milan, where he graduated in 1969. Ferré began his fashion career in 1970 by designing accessories, then worked as a raincoat designer in 1972-74. He started his own company Baila in 1974, and launched his signature collection for women in 1978. His first men's collection appeared in 1982, followed in 1986 by his first couture collection in Rome. Ferré became Stylistic Director of Christian Dior in Paris in 1989, when he was chosen by owner Bernard Arnault to replace Marc Bohan. In 1996, it was announced that Ferré would end his engagement with Dior with the Spring 1997 collection for the label. His own label is more relaxed and pared-down than Dior. Sophisticated white shirts have become the symbol of his personal signature in fashion design. Ferré appeared to be extremely critical of trends and fashion gimmicks. He dealt with his demanding schedule, being responsible for a French top fashion brand and his own Italian label, by commuting between Milan and Paris in his private plane. Ferré had a lakeside home in Lake Maggiore, near Milan. Ferré: Previously known as the White Label, more practical, ready-to-wear for both men, women. Within this line, there are Ferré Red (for plus size) and Ferré Fur. For Ferré men there is also Ferré Underwear. Ferre designed Korean Air's flight attendant uniforms in 2005, using Korean "binyeo" traditional hair accessories. The Gianfranco Ferré S.p.A. is the holding company that coordinates the fashion business of the Ferré label. It was owned by Gianfranco Ferré (Creative Director) and Franco Mattioli (Chief Financial Officer) in equal shares until it was sold to IT Holdings in March 2002. Recently, Ferré announced that the group plans to become listed at the Milan stock exchange. In order to prepare for this movement Ferré started to rearrange the holding significantly. First step was the recruitment of experienced management personnel under the guide of Giuseppe Cipriano. Next step is the reduction of the number of subsidiaries from today 21 to four or five in the future. Another move is the acquisition of the apparel producer Dei Mattioli, which is owned by Franco Mattioli. Ferré also seems to be interested in acquiring some of his contractors, in order to have more control over the production. The company achieved total sales of 950 billion Lira ($589 million) in 1994, an increase of 15% over 1993, which had shown enjoyed a similar increase over 1992 sales. Ferré's 14 licences contributed 58% to total sales in 1994. In 1996, total sales were already at 1250 billion Lira ($811 million). 70% of Ferré sales are achieved in export, where the US appears to be the biggest market with growing importance. Italy still holds 20% of the sales, but the success of the Ferré Jeans business in the US seems to shift the focus here. The Studio .0001 by Ferré line, produced by Italian garment manufacturer Marzotto, is basically targeted at the US market. Ferré distributes in 17 exclusive boutiques worldwide (1994) and has over 250 sales points in total. Though no longer under production, the Studio .0001 and Forma O were produced by Marzotto, one of the biggest Italian garment manufacturers. The sportswear collections Oaks by Ferré and Ferrejeans used to be manufactured by Italiana Manifatture S.p.A., but Ferré contracted those lines for the next ten years to Ittiere, who also furnish the bride collections of Dolce & Gabbana, Versace, and others. The range of licensed products is wide, including shoes, stationery, luggage, home furnishings, and perfumes. The latest addition to this list is the license given to the Swiss watch manufacturer Swatch. Most of the external licenses were eliminated in 2003, leaving only the Gianfranco Ferre mainline, Ferre diffusion, and GF Ferre younger/activewear labels. Ferré died on June 17, 2007. The previous Friday, he had suffered a massive brain hemorrhage. Ferré was hospitalized at the San Raffaele Hospital in Milan, where he was pronounced dead a few days later. ^ Maria Natalina Trivisano (2016). Ferré, Gianfranco (in Italian). Dizionario Biografico degli Italiani. Rome: Istituto dell'Enciclopedia Italiana. Retrieved January 2019. This page was last edited on 18 February 2019, at 16:34 (UTC).